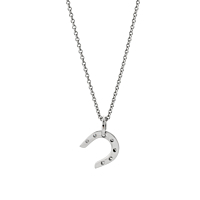 A slender 15" White Gold Chain leads down to a Diamond-laden Horseshoe Pendant on this stunning Necklace from Hermes. The sparkling Diamonds are all Vvs1 E-F Color masterpieces, while the Lariat enclosure offers phenomenal versatility in terms of wearable length. 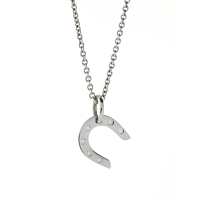 Feminine and sophisticated, this is the sort of exquisite Necklace that will never fail to draw admiring glances.